Economics Letters handles a submission fee of EUR 50 (reduced 30) USD 65 (40) Yen 6000 (4000). The reduced prices are for students. Submissions will only be considered after payment of the submission fee via SubmissionStart. After you submit your manuscript, you will receive an email regarding how to transfer your payment. The submission fee is non-refundable and a paper may be rejected by the Editors without being sent for review, should a paper be inconsistent with the Aims and Scope of the Journal as set out on the Journal website, or not adhere to the style requirements as outlined in the Guide for Authors. The submission fees are used to support journal related activities. 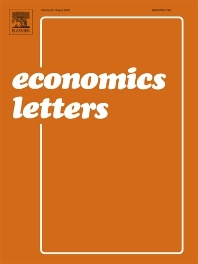 Economics Letters aims to be a valuable addition to the specialist literature, offering quick dissemination and easy accessibility of new results, models and methods in all fields of economic research. All researchers are welcome to submit their articles to Economics Letters, and especially young researchers and advanced graduate students are encouraged to submit their articles. The "letter" format consists of concise communications, which are a vehicle to quickly communicate important pieces of new research. For instance, a theorist could submit to Economics Letters a thought-provoking example before the analysis is extended to a general theorem in a fully fledged paper that will go elsewhere. Similarly, an experimentalist or an empirical researcher could submit to Economics Letters some important preliminary results, where perhaps the threshold for robustness, thoroughness or completeness of the analysis is not as high as it would be for a complete paper. Comments or pedagogical notes are not suitable for transmission in this form. Concise: Contributions are usually limited to 2,000 words (12 manuscript pages), allowing readers to determine their potential interest in a letter very quickly, and to digest a large amount of material in a usable form. Rapid: The fast review process and immediate online publication ensure a brief manuscript turnover time. Efficient: A quick way to stay up-to-date with developments in all areas of economics. All submissions that pass the desk-rejection phase will be subject to a careful peer-review process. With few exceptions, in which submissions are sent back for small editorial revisions before acceptance, each paper will be either accepted as is or rejected. Detailed reports will not be provided; the reasons for the decision will be explained in a brief cover letter from the editor. Economics Letters aims to have a quick turnover time of up to two months between the submission and final decision. Economics Letters and Elsevier uphold the highest standards of academic integrity. Therefore, instances of plagiarism, fabricating or results, and other examples of ethics breach, when properly confirmed, are taken very seriously. The journal imposes a number of sanctions, which include, but are not limited to, a five-year submission ban, and notification to the author's department chair or relevant supervisor.